Tea in India proving popular! Very excited that the three India tea novels are keeping each other company on Women’s Historical Fiction bestseller list today…. 1, 2 and 4! KINDLE DEALS on the TEA NOVELS – festive prices! The first two novels in the INDIA TEA SERIES are on at very special prices for the month of DECEMBER! Curl up with a cup of tea – and be transported to the land of tea! Thanks very much to SHELF PLEASURE for hosting me on their delightful book blog – great questions! TEA AND ROMANCE LAPPED UP BY FRENCH AND RUSSIANS! Today is a red letter day! Two parcels arrived: one containing copies of the French edition of The Tea Planter’s Daughter and the other the Russian version of its sequel The Planter’s Bride. What is so interesting about being published in translation is how the new publishers interpret the stories anew, changing covers and even titles. Presses de la Cité have created a sumptuous, alluring cover of a woman’s face and called it, LES LUMIÈRES D’ASSAM (Lights of Assam). This was chosen for the May catalogue of the prestigious GRAND LIVRE DU MOIS. Both editions are gorgeous in their own way and have been expertly negotiated by Maddy Milburn at The Madeleine Milburn Literary, TV and Film Agency. Merci beaucoup Maddy! Tea Rooms – The Alternative To Gin Palaces? 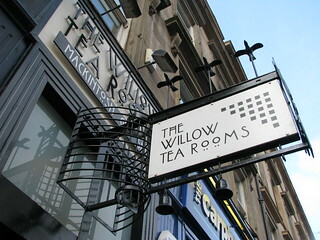 A couple of weeks ago I mentioned Glasgow’s Willow Tea Rooms. These were designed in the early years of the 20th century by Charles Rennie Mackintosh for Catherine Cranston – usually referred to as Kate Cranston, or more formally, Miss Cranston. She continued to use this despite being married to wealthy businessman, John Cochrane in 1892. In many ways, Miss Cranston was one of the central influences for Clarissa Belhaven in The Tea Planter’s Daughter. Eventually Charles would run a small chain of hotels in Glasgow, Edinburgh and London. Importantly, these were to become temperance hotels, offering high-class, alcohol-free accommodation. Perhaps it was the combined influence of her upbringing in Cranston’s Hotels, and her brother’s expertise in the tea business (he was a tea dealer) that led Miss Cranston to open her own unique style of tea shops. These were not the sombre, utilitarian outlets that had become commonplace over the last fifty years or so – they were veritable palaces in the most fashionable of styles. Her first shop (opened in 1878, in partnership with her brother) in Argyll Street was decorated in the contemporary Baronial style. But in addition to the furnishings, and standards of service & hygiene, Miss Cranston had recognised the need to include a social element. In many ways she was creating an alternative to public houses, taking care to offer more than just food and drink. There were rooms for gentlemen only and ladies only, as well as luncheon rooms, billiard rooms, and smoking rooms. The atmosphere was welcome to all, and Miss Cranston’s Tea Rooms became social centres for business men and apprentices; ladies and maids alike. The ladies only rooms were a particular success, allowing women to meet each other and retain their respectability without male company. By 1888, Kate’s business was independent of her brother’s, and she commissioned George Walton & Co, Ecclesiastical and House Decorators to design a new smoking room for one of her tea shops in the Arts and Crafts style. 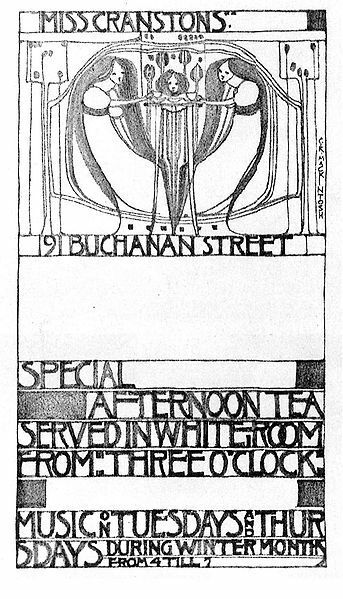 It was in 1898 when she again commissioned George Walton to design a new interior for her expanded shop in Argyll Street that she first met Charles Rennie Mackintosh. At the time, he was working with Walton, and designed some of the furniture, which included his trademark high-backed chairs. 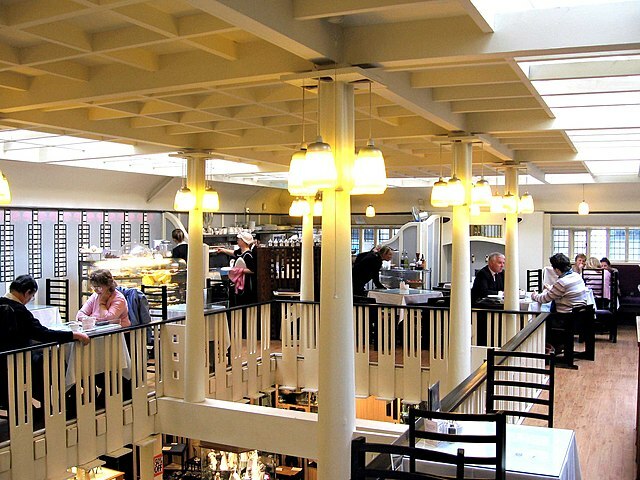 When the Ingram Street shop was re-designed in 1900, Mackintosh was given a whole room to work on. With his new wife, Margaret MacDonald, he designed the White Dining Room and hallway to the street. Margaret was a gifted designer and artist in her own right, and was responsible for many of the flowing, sinuous designs in the murals. Such was the success of this, that in 1903 Miss Cranston awarded the Mackintoshes the commission for the whole of her new tea rooms in Sauchiehall Street. This was to become the Willow Tea Rooms, and is seen as the acme of the Scottish Art Nouveau movement – at least on a par with Mackintosh’s Glasgow School of Art. It is not surprising that Catherine Cranston’s vision of “art tearooms” was a commercial success. She ran the business until the death of her husband in 1917, when it was sold. The Willow Tea Rooms were subsequently incorporated into the adjacent Daly’s department store, and after 1954, only the first floor’s Room De Luxe remained in use. Where Did This Tea Fixation Come From? For me it started in 2006 – I was struggling with the bones of a story about itinerant travellers in late Victorian times. It was to be set in the North East, or maybe the borders, but I just couldn’t get to grips with it. For some reason I just couldn’t find the story to tell. Then one evening I had a life-changing experience when I went to speak to the Mens’ Fellowship at the Methodist Chapel in Stakeford. My husband, Graeme got chatting to the grandfather of one of our son’s friends. 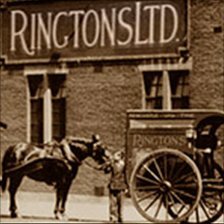 It turned out that he’d started his working life as a driver for Ringtons tea company. Not just any driver though – he drove the company’s last horse and cart van around Blyth. Tea, I thought. I like tea. I buy it in boxes from supermarket shelves now. But where did it come from a hundred years ago? Was it the same as we drink now, or different? What about the supply chain and logistics – both things that we take for granted now, but surely at the turn of the 19th century things were a little different? I had fuzzy images of tea clippers and refined tea rooms, and the feeling that there was a story to be told. I needed to look into this tea business! So as usual, I started my research deep in the bowels of Newcastle’s Lit & Phil. Society Library to see what the archives could tell me. I discovered a world of Victorian tea rooms such as Miss Cranston’s of Glasgow (as in, the famous Art Nouveau Willow Tea Rooms): glamorous places of potted palms and aspidistras, starched linen and waitress service that offered an alternative to the pub and dazzling gin palace. Certainly, Catherine Cranston herself was a firm supporter of the Temperance movement. Then there were the tea merchants: the Star Tea Company, the London and Newcastle, Andrew Melrose of Leith (whose original salesforce all boarded together). In London there was Mincing Lane, where huge amounts of tea were auctioned. It was a world of brokers and bonded warehouses, of agents and lead-sealed chests, of tea tasters and spittoons. I poured over Edwardian government reports into the tea industry, and was astonished at its scale – 4,264 plantations producing over 345 million lbs weight in exports a year. And I found myself pouring increasing numbers of cups of tea to aid my digestion of this huge storehouse of information. Britain, it appeared, had gone bonkers for tea in the late 1800s and early 1900s. We simply couldn’t drink enough of it. Whereas it had once been the preserve of the upper classes, who drank China tea that was so expensive they kept it under lock and key, now tea was being bought and drunk by everyone. How was this possible, and where was all this tea coming from?